In the late 1970s, when I was twelve or thirteen, my father Anthony Vaughan made one of his rare trips to London to deliver a talk to the Johnson Society. It had a somewhat cryptic title: Strangled with a Bowstring: A Clear Case of Character Assassination. 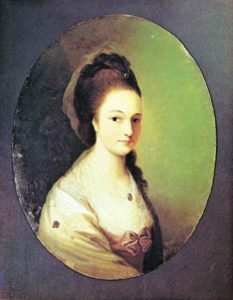 This was a big event, at least in our family, a step in a process that my parents had begun some years earlier – to return one of the great English actresses of the 18th century to her rightful place in history. 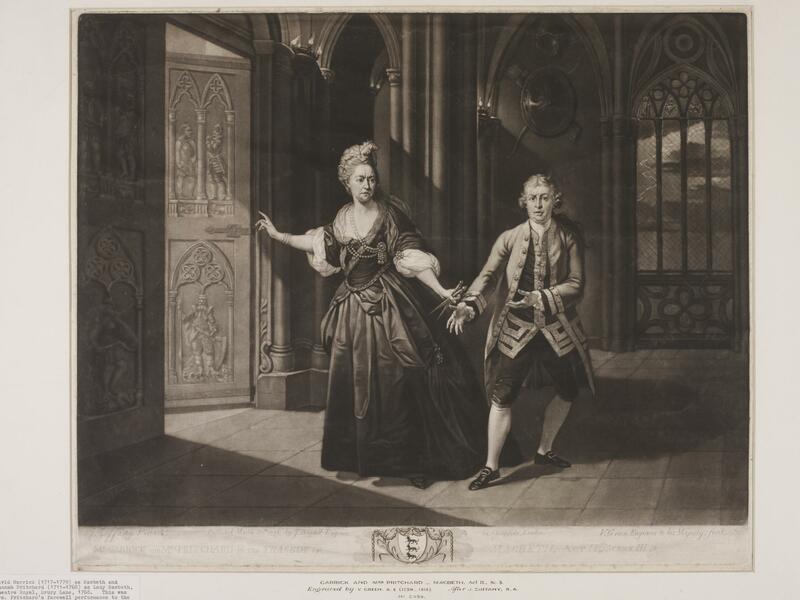 The actress was Hannah Pritchard (1709-1768) and she was without doubt the most versatile female performer of her generation, celebrated as much for her Rosalind as her Lady Macbeth. Posterity had not treated her well. The bowstring in my father’s talk was the one with which Hannah was to be strangled onstage on the opening night of Johnson’s play Mahomet and Irene, As the drama reached its climax and the bowstring was placed around Hannah’s neck, the audience cried out “Murder! Murder!” and much to Johnson’s fury Hannah “was obliged to go off the stage alive.” The character assassination was what followed. Johnson blamed Hannah for the play’s failure, and his dismissal of her as a “vulgar idiot” has never been quite forgotten. My father came back from London triumphant. Working closely with my mother Jenny, he had recently completed Born to Please (STR 1979), his meticulously researched biography of Hannah. The talk was the final flourish in his defence of her reputation. Posthumously, Hannah had enjoyed her day in court and her defence was on the record. Three-and-a-half decades later, when my father heard that plans were afoot to renovate the triforium in Westminster Abbey, he began a correspondence with the Abbey Librarian Tony Trowles and offered to contribute to the costs of repairing Hannah’s memorial. He died in 2014, but my sister Sarah and I were keen to honour his commitment. The monument had been removed to the triforium from Poets’ Corner as recently as the 1930s – by no small irony to make room for a bust of Dr Johnson – and it had been neglected ever since. Perhaps at this point I should declare an interest. Hannah’s brother, the fanmaker Edward Vaughan, was our seven times great-grandfather and when Sarah and I were children and our parents were absorbed in writing Born to Please we thought of Hannah almost as a living member of our family. As providence would have it, the opening of the Queen’s Diamond Jubilee Galleries in the triforium coincided exactly with the 250th anniversary of Hannah’s death. 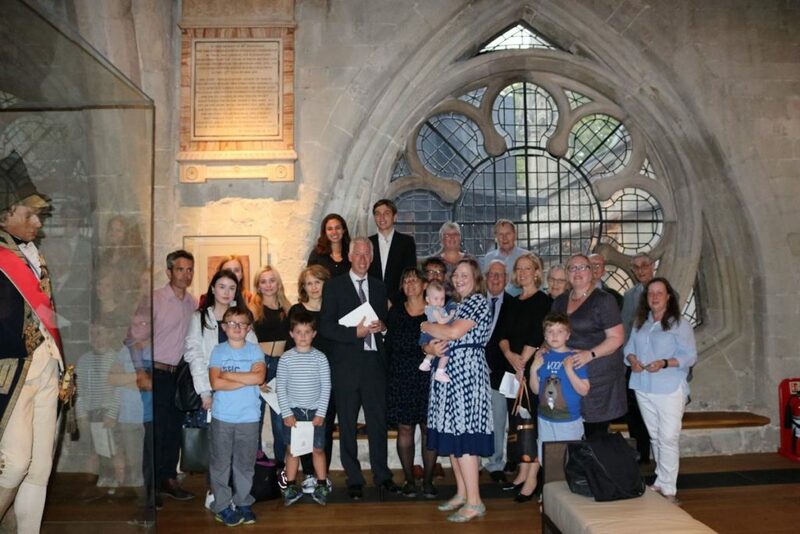 The Dean of Westminster, John Hall, agreed that it would be suitable to mark the anniversary with a ceremony of re-dedication in situ, with the freshly renovated monument as a backdrop. Aptly enough it is just a few footsteps away from the monument to another great figure of 18th century theatre, John Gay, in whose Beggar’s Opera Hannah played Lucy. I wrote to Professor Fiona Ritchie at McGill, to discuss the idea of an evening in celebration of Hannah’s life. Fiona knows more about Hannah than any other living historian and her monograph on women and Shakespeare in the 18th century gives many insights into Hannah and her career. She was enthusiastic, and when Harriet Reed from the Society for Theatre Research came on board, offering both practical and financial support for the event, it was just a question of organisation. 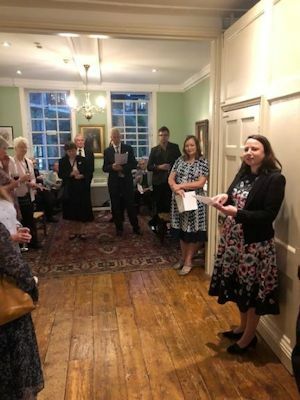 Fiona put me in touch with Celine Luppo McDaid, the Curator at Dr Johnson’s House on Gough Square, and by rather a nice irony that I think both Johnson and Hannah Pritchard would have appreciated (neither lacked a sense of humour), the house became the venue for the event. 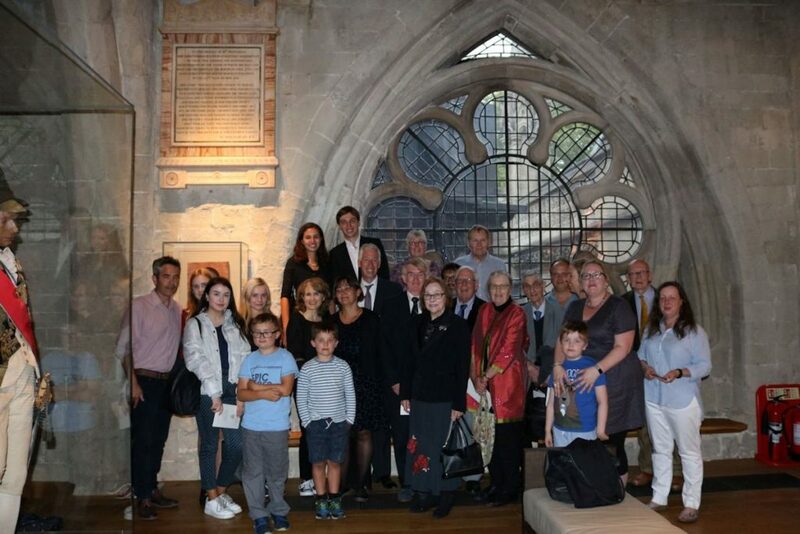 The rededication at the Abbey took place after Evensong on 4th September. It was attended by admirers and family of Hannah Pritchard. Proceedings were opened by the Dean, who drew attention to the newly-acquired dignity of the surroundings. 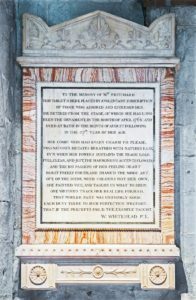 Hannah’s eight-times great niece, my daughter, another Hannah (her name is not entirely coincidental), recited William Whitehead’s poem inscribed on the monument at the request of “those who admired and esteemed her”. With typical 18th century hyperbole the poem enthuses about Hannah’s virtue at home and her versatility on the stage, drawing attention to her ability to portray vice “in colours not her own.” It has sometimes been said that Hannah’s lack of vice in her personal life was in part to blame for our amnesia concerning her remarkable achievements on the stage. Then, as now, people loved gossip. I gave a short address, talking about Hannah’s life and family. I have always been amazed by her ability to combine her career with her many other commitments. The list of her roles and performances is long and varied, and in her whole career she was never absent from the stage for more than a few days. Yet she enjoyed a happy marriage to theatre manager William Pritchard, and all the evidence suggests that she was devoted to her three daughters, Judith, Tamary and Hannah Mary. Still more remarkably, Hannah and William found time to run a successful theatrical dressmaking business. Hannah dressed the 17-year-old Queen Charlotte for her marriage to George III, and by some reports she even gave the nervous German princess lessons in comportment. Hannah also had a great capacity for friendship, most notably with her fellow actress Kitty Clive, to whom she remained close till the end of her life. Fiona Ritchie called on the Dean to rededicate the monument. Prayers followed, led by the Minor Canon and Precentor Christopher Stoltz, and the rededication ended with a blessing from the Dean. You may view and download the Order of Service here. At Dr Johnson’s House an hour later, proceedings continued in a less formal spirit. Celine welcomed her guests, drawing attention to Hannah’s connections with Dr Johnson, which extended, of course, far beyond his unfortunate “vulgar idiot” outburst. In fact, he was a great admirer of Hannah on the stage. Fiona Ritchie gave a talk about Hannah as an eighteenth century “superstar.” She used the term not in the trivial sense but referring to the remarkable level of respect that Hannah built up in the course of her life and her influence on the history of the stage. Fiona argued convincingly that in her time Hannah enjoyed a status that equalled that of any of her male contemporaries, including even Garrick, and she pointed to the considerable independent fortune that went with her success. In later years Hannah bought and rebuilt a villa “Ragman’s Castle” close to Horace Walpole’s Strawberry Hill in Twickenham. Walpole was hugely proud of having her as a neighbour. I added a few details about Hannah’s family. Her daughter Hannah Mary became an accomplished actress in her own right, and her granddaughter and great-grandniece both became novelists. Her brother’s descendants (my own family) remained in one way or other involved in the trades in the East End of London for the next three hundred years, with several generations marrying into Huguenot families. The evening ended with a spirited rendition by Georgina Wilson of the love song O Come, o come, my dearest, accompanied on the piano by Rachel Storm. This is the only surviving song from the masque The Fall of Phaeton. The music is by Thomas Arne and the libretto is attributed to Hannah’s husband William Pritchard. There is something innately transient about the theatre, but a trace of the spirit of a great performance always remains. I am sure that the imprint of the remarkable 1740 production of As You Like It, in which Hannah played Rosalind, full of energy and humour, alongside her friend Kitty Clive as Celia, will remain with us as long as Shakespeare himself and in some way has influenced every subsequent performance of the play. To a certain extent the same is true for each of Hannah’s performances, in both comedy and tragedy. But for Hannah Pritchard all the world was not a stage. Her life offstage was undramatic, some would say dull, but it seems to have been full of warmth. We know that she died surrounded by the love of her family and many friends. And I would like to think that this too has left an indelible trace on generations that have followed.